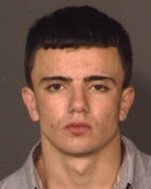 …Arrested last Friday in connection with a string of necklace snatchings in the Bronx, Mr. Vuktilaj made bail the next day, celebrated his 18th birthday on Sunday, was re-arrested Monday morning and proceeded to lead the police on a prolonged manhunt in subway tunnels and around Harlem after he escaped — handcuffed and shoeless — from custody. The pursuit halted service on several lines for more than two hours in Manhattan, Brooklyn and into the Bronx as officers and police dogs searched the tunnels around the 145th Street subway station…The chase, which lasted about five hours, ended around 3:30 p.m. when the police grabbed Mr. Vuktilaj, who was still handcuffed, as he emerged from a subway station at West 135th Street, the police said. Mr. Vuktilaj is accused of approaching at least two older women on the street in the Bronx last month and ripping the chains from their necks, according to a criminal complaint. Those two thefts were part of a pattern that included at least two others. On Monday morning, after Mr. Vuktilaj had made $2,500 bail and been released over the weekend [so he could be free on his birthday, according to an earlier version of this article], the police went to his apartment at 141st and St. Nicholas to take him in for questioning on the remaining thefts, they said. A City Room commenter, R.B., alerted us to a video posted on Myspace in 2009 by a Vincens Vuktilaj. Over the hip-hop song “Proud To Be Albanian” by the Albanian group Etnon, the video shows a parade of images that include photos of a youth who looks like a younger version of the person in the photo of Mr. Vuktilaj released by the police. Here’s that video, though I can’t tell if it is indeed the same Vincens Vuktilaj. Notice in the video the graffito “Who Runz New York.” My favorite line in the song, meanwhile, aside from the needs-no-comment title “Proud to be an Albanian,” is the one quoted by R.B. in his comment: “I don’t need to be a gangsta. Bein’ Albanian is even worse.” There you have it from the horse’s mouth!